When I moved to Canada a few years ago, Montreal welcomed me with free French classes and pastries. To be clear, only the French classes were free. Also there were no pastries in the French classes, or I totally would have gone to more of them. Anyway, in that class, I learned a lot of words: Pencil sharpener (le taille-crayon). Squirrel (l’écureuil). But I would have been a happy immigrant indeed if they had taught me only one: chocolatine. Chocolatine is not a Quebec invention, though it is done particularly well here. Like French itself, the pastry is a European import installed in Quebec with its own linguistic peculiarity. Debate can rage about which term is correct and “chocolatine” does contend for some territory in Europe with the phrase “pain au chocolat.” It’s also known elsewhere as simply a chocolate croissant—and whatever you want to call it, the chocolatine is, at its basest construction, croissant dough wrapped around chocolate. But it is far more than these barest descriptions suggest. The chocolatine is a chocolate and butter bastion of civility in a world that at times undervalues a pastry well done. In Montreal, the chocolatine is as omnipresent as it is uncomplicated. If a café sells just a few types of pastries with its coffee, one of them is bound to be a chocolatine. And if there’s one pastry I’d want to be sold nearly everywhere, this is it. 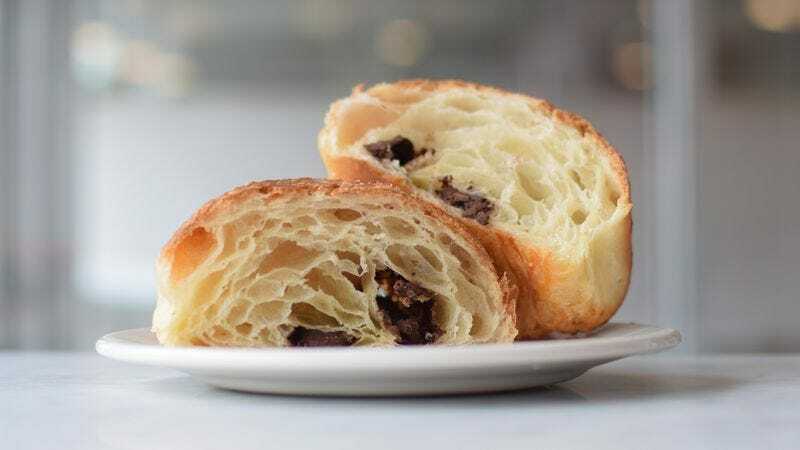 The name “chocolatine” may suggest some sort of cocoa bomb, but it’s actually surprisingly refined—a pastry for people who know to use their indoor voices, with an adult equilibrium between the sweetness of the chocolate and the buttery blanket surrounding it. In fact, the two demure batons of chocolate buried inside may only announce themselves after a few bites. Entering a bakery can mean smelling chocolatines well before seeing them. The yeast dough surrounding that chocolate is how the chocolatine makes its introduction, the first tangible sign of its pastry perfection. In the kitchen, the butter-laden dough is pressed and folded repeatedly to create layers. In the oven, when the water in the butter turns to steam, it pushes apart those layers and creates air pockets. The artfulness of that layering is what separates a top-quality chocolatine from an also-ran. Personally, I like to supervise my chocolatines being made, so I gravitate to La Fabrique Arhoma, where a broad window provides a view from the street into the bakers’ workspace. Another solid bet, this one with a second-floor view of the pastry action below: Mamie Clafoutis. But anyone can tell a well-made chocolatine from a poor one. The outermost layer should be golden brown from the heat of the oven, and when biting into it, it should shatter and leave crumbs—shards, really—indelicately scattered. It’s not a potato chip; we’re not after explosive crunch here. It’s also not a hamburger bun, and shouldn’t be pillowy throughout. The contrast between the slight crackle of the outside and the soft inside is what matters. The inner pastry should reveal distinct strata inside. Approaching the chocolatine from a certain angle should be like unwrapping a gift. The layers peel away until the chocolate core reveals itself. The chocolate in a warm chocolatine will sometimes be melted and slightly gooey. In a chocolatine that has cooled, the chocolate may be solid. Either is acceptable, though warm is certainly preferred. In a good chocolatine, it’s never a question of “chocolate filling”; there is no pasty, bastardized Nutella here. It’s just chocolate—not too dark, not too sweet. Perhaps growing up with chocolatines would make them seem utterly ordinary to Montreal natives, no more special than a piece of toast or a bowl of cereal. If that’s the case, I feel fortunate to have come to them later in life. Keep your poutine; this is all the Canadian delicacy I need.